Marine Appliances by Dometic: Shopping Time! We all love our wives. We really do. And as much as we cannot understand their sudden cravings of running aimlessly in and out of all kinds of shops to buy all kinds of stuff: I must admit, I love the look in their eyes when they do arrive back home, heavily laden with scores of bags. Proud smiles. Adrenalin and Endorphins. Well, as much as some of us men do take a swipe at such behavior, there are similar occasions when our brain disintegrate and we simply buy shops empty (though it´s not lingerie and stilettos we do have in our bags). Last week such a buying-rampage happened to myself and as it rang on the door and a big white truck unloaded its cargo it have been my eyes, blurred by happiness: A score of marine appliances for the Kings Cruiser 33 refit project arrived. And here´s what I´ve got. My sailing yacht is originally equipped with a cooling system. An external cooling unit built in the port side cockpit locker. It´s old, rusty and – above all – will eat up a lot of electricity. In addition, the cooling chamber is huge: I really don´t know why they´ve built the Kings Cruiser 33 with such a big cooling unit. Unless sailing the hot Caribbean (which I suppose I will never do with this boat) there´s simply no need for such a huge thing. So I need an alternative. The Dometic Compressor cooling unit CFX 28 seems just perfect. On the one hand it´s as small as I liked it to be: Some 26 liters of internal volume is just right for my purpose. As I will sail mostly over stretched weekends all I need to cool is some fresh milk for the kids, butter and some meaty stuff. I don´t need freezing capacities nor am I constraint to have ice-cold bottles of Champaign at hand, although this machine can freeze as deep down as minus 22 Degrees Celsius! 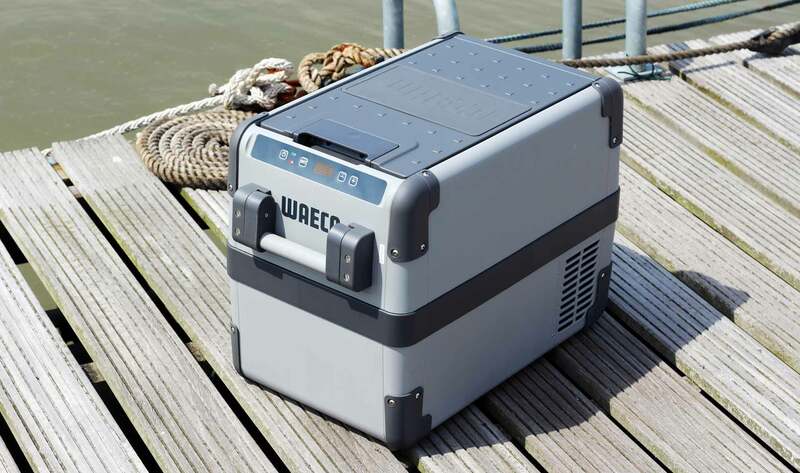 This appliance has a power consumption of just 0.3 Ampere per hour (when placed in 20 Degrees Celsius surrounding temperature) or 0.6 Ah in 32 Degrees Celsius. That´s way less than the old 40 year old fridge. The CFX is smooth as a cat: The 40 Watts compressor will only generate low noise. Perfect. I love cooking at home – as well as onboard. When underway on the different cruises with the Pogo 40 or during my SKS/RYA Coastal Skipper-cruise on the X-Yacht 442 I happily volunteered to have at least one meal prepared in the ship´s galley (to have cooked this simple yet tasty recipe “Spaghetti a la X-Yacht” for example). What I particularly liked was the Stove on the X. Why? Because there was no need to mess around with a lighter to fire up the stove. Just a push on a button. 12 V ignition. I want such a thing! The Dometic Moonlight Two is just right for the purpose on my Kings Cruiser 33. It features the same electric ignition technology as the 3-flamed-stove on the SY MERENNEITO. But I am sure I never need three flames as I want to keep preparing meals on my ship simple and “no frills” as well. So the two-flamed stove seems just perfect. The finish of the appliance is awesome: Polished stainless steel, dark carbon-like panel and a large set of accessories like semi-cardanic mounting and heeling-prevention-stuff complete the package. 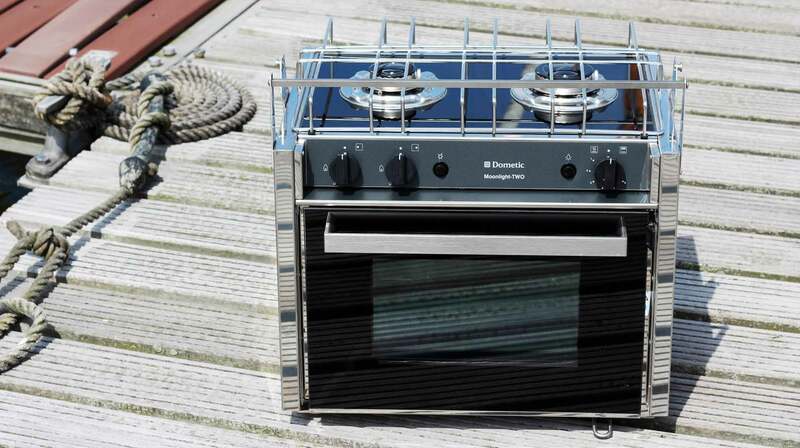 I am so much looking forward to have this stove build into the new galley of my yacht! As you may have read recently, I´ve had the yacht electrician Thomas visiting my boat. He is going to refurbish the whole electric wiring including installation of LED-lights for the ship. He was putting a great emphasis on loading management of the batteries and a well thought-through concept of the whole electric installation of the yacht as well. 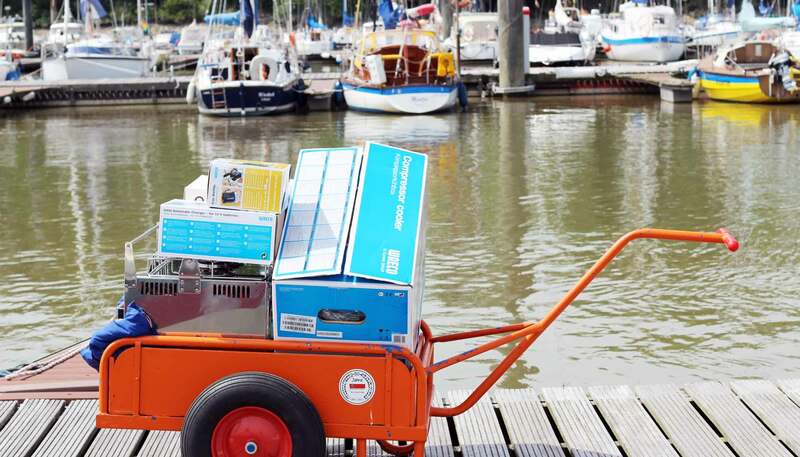 To have an intelligent loading management of the batteries, some appliances are needed. It´s again Dometic to offer just the right thing: The IU0U Automatic Loader for 12/24 Volts was the right choice, as I was reassuring myself with Thomas´ opinion on the purchase first. 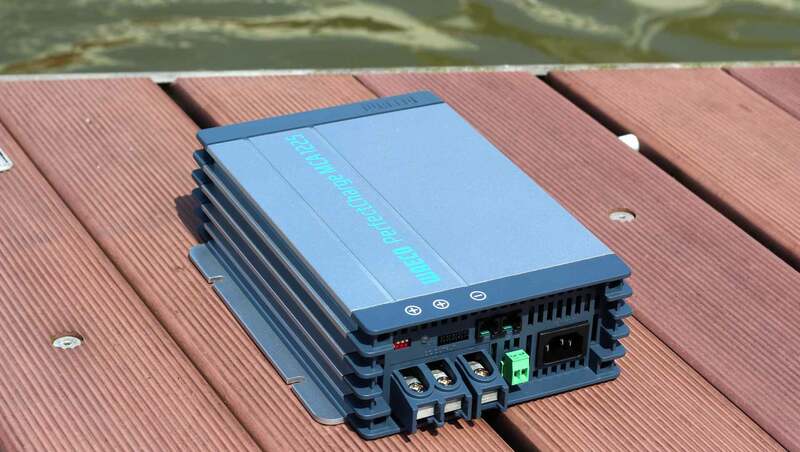 This appliance will automatically regulate the charging of the yacht´s batteries when connected to land-based electricity supply. Where to put all the official documents when underway? ID cards and passports, SRC and other official certificates, personal documents as well as the board cash? I know of long distance sailors who have laminated safes into the structure of their boats to have this kind of material stowed safely. 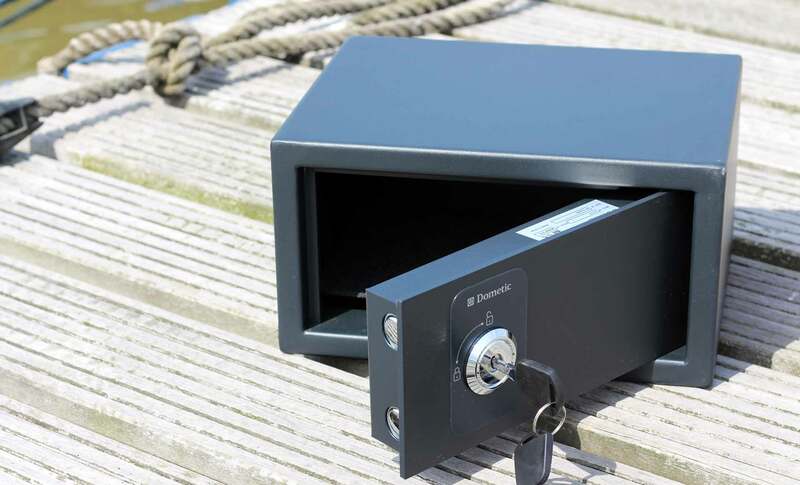 Well, I don´t think I am going to have experiments with laminating a safe on my own yacht, but I have an idea where to put the safe. The new safe is small enough to not weigh in too much but big enough to offer space for storing the really important documents and the board cash safely. Hate to run around and turning everything upside down to find this one particular certification to show to the boarding party of officials? Then this single one place to put all this is the solution. Again, it´s a product by Dometic/Waeco. I am travelling with children. Small children. That means, there´s virtually every time need for a tea, a hot milky drink or simply a hot-water bag for mommy. As ordinary electric kettles need 220 V and can thus only be utilized when the ship is moored (unless there´s a 220 V converter onboard) one needed to fire up the stove to fabricate boiling water. Cumbersome. So the last appliance of my buying rampage is an electric kettle suitable for 12 and 24 Volts. This tiny appliance may look a bit odd, but it improves family life onboard in such a significant way! The kettle I went for has a 0.75 liters capacity which is more than enough for a quick tea, freshly brewed coffee and all the nice tasty little things my kids appreciate so much to forge falling into sleep or just having a nice little baby bottle. 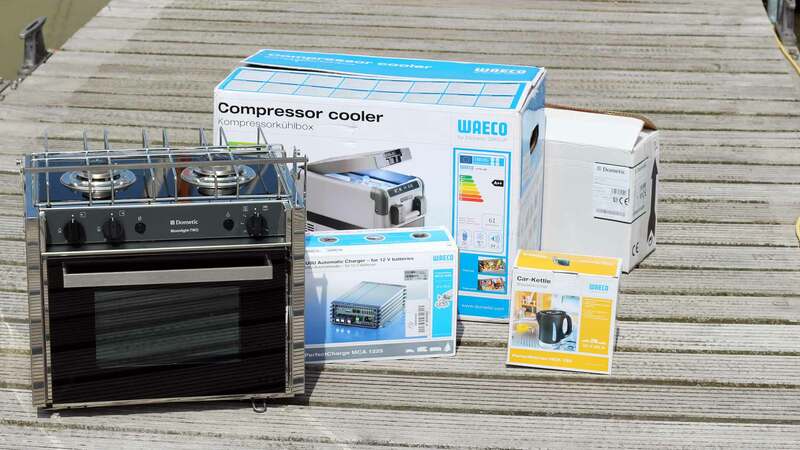 I was keen on having the shown products delivered by Dometic – by the way, this company is called Waeco in Germany after the founding brothers who built their first electric mobile fridge back in the Seventies. 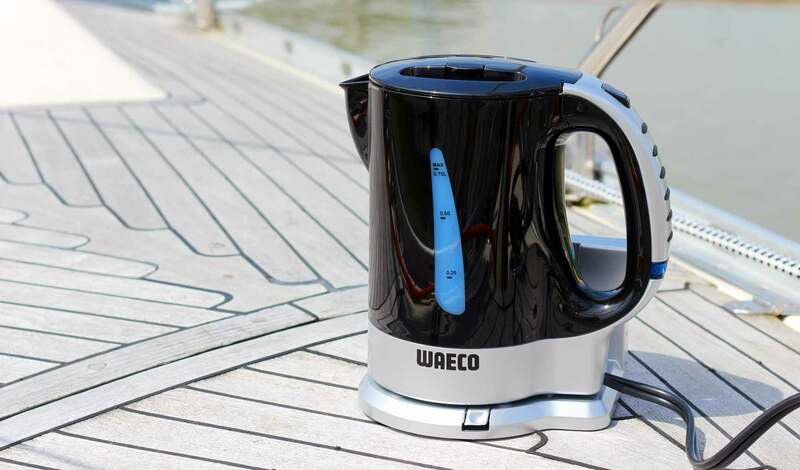 Since then Waeco and some other brands converged into Dometic Group which is one of the world´s largest and leading manufacturers for mobile appliances: Marine, caravaning and airborne appliances are their specialty. As I am right now in the middle of refurbishing the wooden parts of my yacht, as you may read here it will take some time until I can install these new fine appliances. Of which having a replacement for the fridge and the new stove will be the first two. So I´m looking forward to having my galley equipped with a load of Dometics and … some ease from the tiring Adrenalin rush of the past buying rampage. My plans for new electric wiring of the sailing yacht.